EDITOR'S NOTE: The original version of this story incorrectly said that the 2010 Mercedes-Benz E-class coupe is built on a C-class platform. Although some components are shared with the C class, the E-class Coupe shares the majority of its components and technology with the E-Class sedan. STUTTGART -- The new Mercedes-Benz E-class coupe was given the signature look of the E-class sedan, visible in the sweep of the rear pontoon fender. But beneath its compact, muscular exterior lies several components of the smaller, less expensive C class. The E-class coupe was introduced at the Geneva auto show in March. Wolfgang Bremm, product manager for the coupe, says Mercedes aims for a high score on environmental issues. 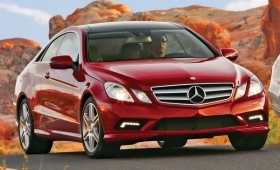 The new E250 CDI diesel delivers 204 hp, 36 percent more than its predecessor, the E220 CDI. But the E250 consumes 17 percent less fuel. Mercedes lists the European Union fuel economy of the E250 at about 46 mpg. "That makes us more fuel efficient than comparable models in this performance class," Bremm said. The E-class sedan comes off the line in Sindelfingen, but the coupe is built in Bremen, as is the C class. Mercedes did not disclose its sales goals.